Excelsior really was the prince of magicians. His trickery touched the limits of the temporal world. In matters of speed and sleight of hand, a more accomplished artist could not be imagined. Is this the man we see in Excelsior! : a brief film, only two minutes long; and old—dating to nearly the dawn of the medium? In it, Excelsior delivers his stage show, with an assistant who doubles as his chief prop. 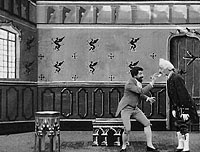 The magician is played by Georges Méliès, the French cartoonist, theatre owner and (yes) stage magician, turned filmmaker. Méliès knew how to entertain. And he knew that filming a stage-magic show in 1901 would provide middling entertainment at best. The film would be but a snippet of a whole show: short in duration, absent the colour and glitz of a live show, and missing the magician’s voice. What a film could do, however, was deliver tricks no stage show, no matter how complex, no matter how adept the performer, could ever duplicate. The simplest effect—just having his actor freeze in place, stopping the camera, altering the scene, then starting the camera rolling again—allowed Méliès a near infinite range of magical options. In Excelsior!, we see Méliès position his assistant before a goldfish bowl, angling him forward; he taps the back of the man’s head and a fish appears in his mouth. The fish is dropped into the bowl. 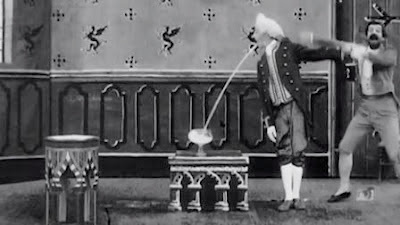 And more impressively: the assistant standing in profile before us, then Méliès see-sawing his arm like a pump-handle, then the assistant becoming a pump: arching a stream of water from his mouth. We know the assistant can’t really be doing this—there’s too much water. 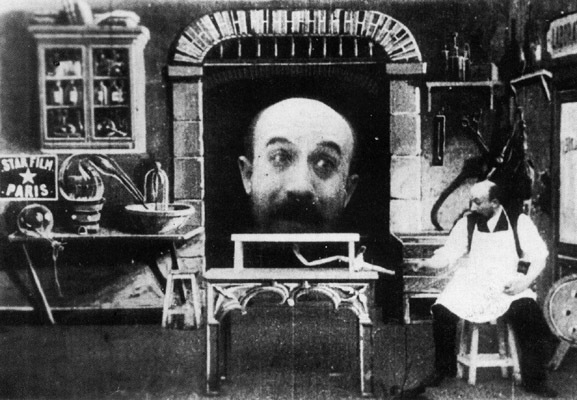 But no other mechanism can be seen and there was no preceding moment—that we saw—during which Méliès could have installed a machine behind him. Nor any guise sufficient to hide it beforehand. It must be magic. Of course, it’s the camera. With our well-tuned modern gaze we notice a slight stutter of the image as the assistant is positioned in place. In that fraction of a second of recorded time (which could be seconds or minutes or hours or days of real time) Melies placed something behind the assistant’s head. Some sort of spigot. The assistant’s head entirely obscures it from us. This trick would be impossible to achieve onstage, for a couple of reasons. First, there would be no pocket of time into which Melies could slip to retrieve and place a device—any device would have to be onstage the entire time, perhaps disguised as something else. Second, the obscuring of the spigot behind the assistant’s head only works if one views the trick straight-on. No one seated in a theatre’s wings or balcony would be fooled. This is the beauty of early, fixed-camera films like Excelsior! (though it’s usually described as a fault): the audience is allowed only one angle on the action. Our capacity to discern the mechanics of a magic trick is seriously limited, but the power of the magician is greatly increased. I have a copy of Excelsior! Prince of Magicians on my four-disc set, Georges Méliès: First Wizard of Cinema (1896 – 1913). The liner notes in that set classify it as “trick/magic,” which is certainly accurate. But Excelsior! is different than some other “trick/magic films” identified in those notes: like The Four Troublesome Heads (1898) and The Man With the Rubber Head (1901) (pictured). Those films, as stage-bound as they appear now, left the reality of stage magic entirely behind. In those films, events are seen to occur that could not possibly, really, be happening. Not unless we believe Georges Méliès could survive a beheading… or perhaps several. It’s odd—traditional stage magic is supposed to show us impossible sights too. Yet we know they’re not impossible. We know that, if we’re seeing it happen, the skill of the magician has made it happen, in a way unclear to us. Wherever the rabbit was a moment ago, it wasn’t really in that hat. But it was on the stage, or nearby, seconds before. 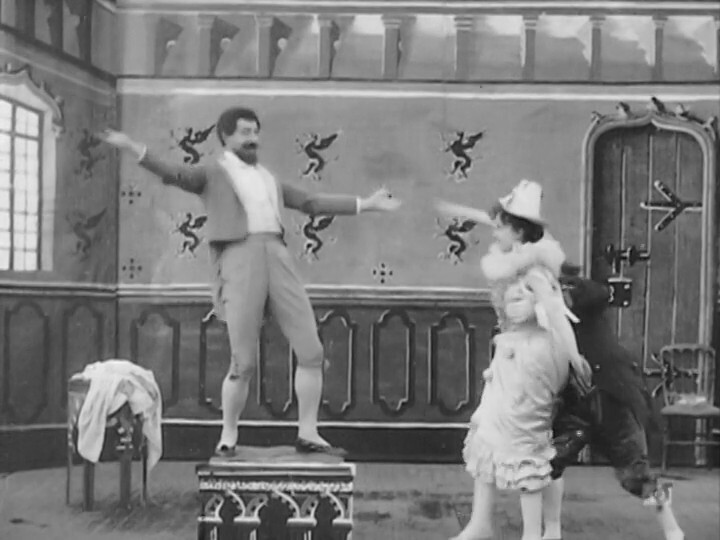 With Excelsior!, Méliès attempted to recreate that particular covenant between audience and performer. Most of the tricks are extreme, but they’re not outlandish. To an audience less sensitive to obvious cuts, it may be that some of Excelsior’s tricks really could have fooled, in the knowing way that stage magic fooled. Even the moment when the goldfish bowl bursts into flame could be doable onstage, I think. But, along with the spigot trick, there’s one more trick that could not be. It’s the one where Méliès, standing on a small chest, whorls a sheet and produces under it a giant lobster. The lobster is a set piece. 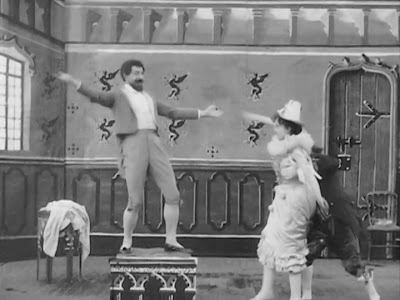 The assistant holds out his arms and Méliès lobs the lobster into them—and, in one lovely, smooth motion, the lobster that left the magician’s arms lands in the assistant’s arms in the form of a beautiful woman. This is the film’s cleanest cut—doubly effective because we’re watching the lobster in motion rather than still, and not watching the stationary assistant at all. It is a perfect trick, and ironically, the one that most betrays the film. For this could only be done in the camera. Imagine what went through the minds of the men and women who witnessed this and drew that conclusion. This new medium made anything possible, they must have realized. But it came at a price. No longer did performer and audience have to share the same space, and the same time. And no longer would it be clear where, or when, the illusion stopped. You can also find Excelsior! Prince of of Magicians on Disc Two of Flicker Alley’s tremendous five DVD set, Georges Méliès: First Wizard of Cinema (1896 – 1913).